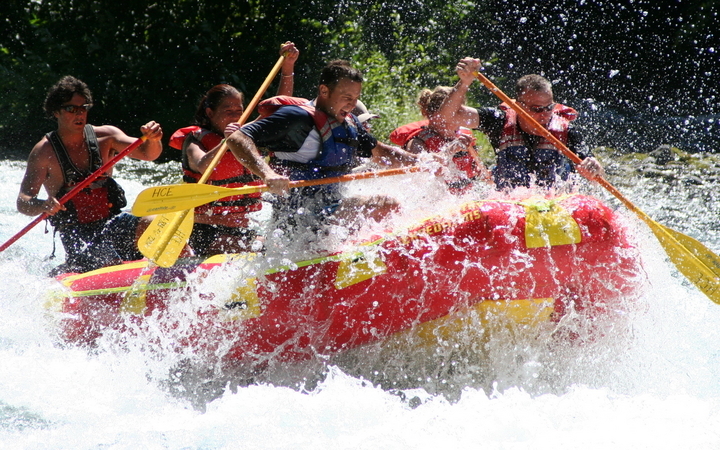 A thrilling whitewater rafting experience near Bend & Eugene, Oregon! The half day McKenzie rafting trip is our most popular. It is perfect for small and large groups, kids and veteran river folk alike. We offer two launch times to choose from daily. Morning and Afternoon trips meet at 9:30 a.m. and 1:30 p.m. at one of our three per-designated McKenzie River locations. In McKenzie Bridge, by our new office located now at the McKenzie General Store complex or at the upper overflow parking area of Belknap Resort and Hot Springs. These are only a short drive from Eugene or Bend, Oregon. (**Belknap guests receive a discount on all 1/2 day rafting trips.) In the fall, we offer trips meeting at noon to take advantage of the warmest part of the day. After the initial paper work and introductions have taken place, we pile into our vans and head up to the boat launch. Having our office at the McKenzie General Store complex (our Belknap office has moved) gives you the advantage and increased security of leaving your car here rather than on the side of the road at the boat launch or at a campground. We provide everyone with all necessary paddling gear once we reach the boat launch. This includes paddle jackets (a nylon top with neoprene wrists and neck cuffs), splash pants (made from urethane coated nylon) and booties. These items are provided on cooler days or by request and free of charge. After a thorough safety and equipment orientation, we launch and begin our adventure. This is usually about 30 to 45 minutes from the time we meet. The trips are approximately 12 to 14 river miles long depending on water levels. You are always guaranteed approximately 2 1/2 hours on the river. At the end of the trip, we load the gear onto our trailers and take you back to one of our three per-designated McKenzie River locations. In McKenzie Bridge, by our new office located now at the McKenzie General Store complex or at the upper overflow parking area of Belknap Resort and Hot Springs. Belknap Resort and Hot Springs. At Belknap you can soak in the relaxing 100+ degree hot springs pool ($8.00 per person), walk beautiful and lavish flower garden trails and browse our store for souvenirs, including maps, books, shirts, hats and much more. Description The half day 14 mile McKenzie river rafting trip is our most popular. It is perfect for small and large groups, kids and veteran river folk alike. We offer two meeting times to choose from daily. Morning and Afternoon trips meet at 9:30 a.m. and 1:30 p.m. at one of our three per-designated McKenzie River locations. In McKenzie Bridge, by our new office located now at the McKenzie General Store complex or at the upper overflow parking area of Belknap Resort and Hot Springs. All trips meet at & return to three per-designated McKenzie River locations. In McKenzie Bridge, by our new office located now at the McKenzie General Store complex or at the upper overflow parking area of Belknap Resort and Hot Springs.